The markets took a breather from their recent declines as the S&P 500 rallied 2.86%, the Dow 2.75%, the Nasdaq 3.97% and the Russell 2000 3.55% during a week that featured the worst Christmas Eve in history, a historic one day rally, and a stunning reversal in late trading action another day. The markets end of the year Santa Claus rally, which after a poor start on Monday began taking shape on Wednesday, pared the benchmark S&P500 index's monthly decline to 9.9%. The Dow Jones Industrial Average, the Nasdaq Composite, and the Russell 2000 also cut their monthly losses to 9.7%, 10.2%, and 12.7%, respectively. Nine of the eleven S&P 500 sectors finished the week with gains with consumer discretionary, information technology, communication services, and financials leading the advance. The utilities and real estate sectors were the lone groups to finish with losses. Investors had to wait for the rally, though. The holiday shortened trading week began with a continued effort to reduce exposure to risk, which left Wall Street with little Holiday joy to cheer for. Nevertheless, the belief that the market had become deeply oversold, in conjunction with rebounding oil prices, strong holiday sales, and some short covering, helped drive the S&P 500 to its best one-day gain, up 5.0%, since March 2009. What ensued was an unsurprising inclination to sell into strength. What surprised many, however, was the reemergence of the buy the dip mentality that carried stocks from steep losses to notable gains in the same session. Many attributed the late reversal to pension fund rebalancing activity, but short covering and a rush of speculative buying interest likely played a role in turning things around in such a hurry. 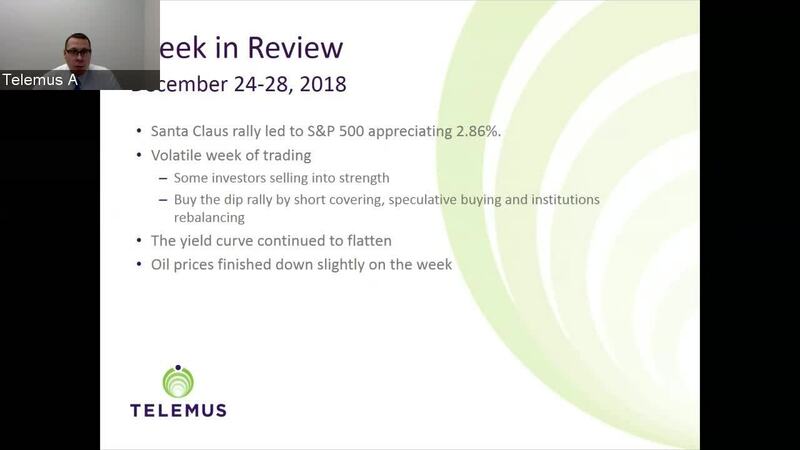 More so, the ability to hold up last week in the face of bad news, which included the partial government shutdown, some softening economic data, and the European Central Bank highlighting an expectation for slower global growth in 2019, added to the bull case for a sustainable rebound heading into 2019. The bond market, though, signaled a more cautious minded mentality with risk free U.S. Treasuries remaining a safe haven and impervious to selling efforts. The 2 year yield declined nine basis points to 2.52%, and the 10 year yield declined five basis points to 2.74%. Crude oil, after declining in sympathy with stocks earlier in the week, rallied to finish down only slightly at $45.12 a barrel.